See how Backup E-mail works for yourself! 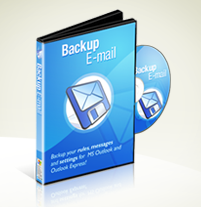 Open Backup E-mail and select your e-mail client. Choose the items you wish to backup. You can also specify a password if you wish, to protect your backup file(s). PLUS: Latest version now fully supports Windows Mail! When you've selected your options, click to begin the backup. This may take anything from a couple of seconds to a few minutes. Keep your backup files safe! Step 3: Restore whenever you want! If you wish to restore your e-mail messages, rules, account settings and other information, simply double-click on your backup file and let Backup E-mail do the rest! You could restore on another computer or on the same PC -- immediately, or months later. With Backup E-mail, YOU decide what to do with your data. If you're experiencing difficulties with our program or site, simply contact us via our dedicated support site from the widget below. We guarantee to answer all of your questions quickly and efficiently, with technicians regularly available to assist you.